If you’re like me, you’re always losing, but then eventually finding your AirPods — often in some strange, unheard of place like my pocket. While I should always just keep my AirPods in their charging case when I’m not using them, this is something I rarely remember to do. It looks like Apple could have plans to lend a helping hand to irresponsible people like me if there is any truth to a September 2017 patent filing by the Cupertino, California-based tech giant, as first reported by Apple Insider. Currently Apple’s AirPods are capable of emiting an audible tone in order to help you find them. That said, you still need to be within earshot of the AirPods in order to hear the noise. This means that if your AirPods happen to be at the bottom of a laundry hamper, or buried under a couch cushion (not that this has ever happened to me, of course), sometimes this feature unfortunately just doesn’t work. 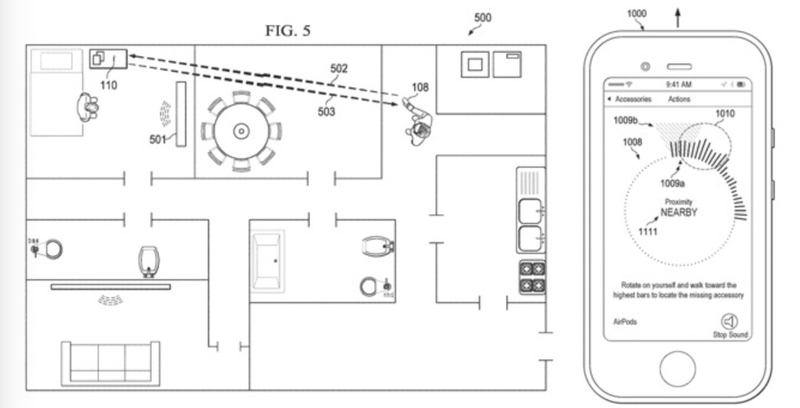 This patent application, called ‘Locating Wireless Devices,’ takes advantage of the iPhone’s microphones in order figure out exactly what direction a sound emitting from the AirPods is coming from. Another more advanced version of the technology outlined in the patent uses higher frequencies that humans aren’t able to hear, but that can still be picked up by the iPhone’s mic, allowing this beamforming technology to work under noisy conditions. The patent filing also discusses how sensors in the AirPods could help determine the wireless Bluetooth earbuds’ physical position, with the user being guided to the specific location through an in-app compass. As always when it comes to patents, it’s possible that this technology could never make its way into a pair of AirPods. On the other hand, this useful tech could be featured in the rumoured AirPod refresh Apple could launch this coming Fall.